To release Kansas from the financially troubled Brownback years, state legislators first had to reverse the governor's disastrous tax experiment. That was step one, last year's job. Now they must move to step two: properly fund public education. Kansans have long prided themselves on having top-notch public schools. Excellent schools serve an important economic development role by attracting and keeping families. In many smaller communities across the state, the public school provides the bedrock for a town's economic and cultural activity. Given the importance of schools to Kansas and the fact that they are the largest state budget obligation, lawmakers simply must get the dollars right. Until school funding is deemed adequate, equitable, and predictable, Kansas finances cannot emerge from turmoil and stabilize. "Adequate" and "predictable" hardly describe school funding in the last decade. Base state aid per pupil has dropped from $4400 in 2009 to barely over $4000 today. No wonder the Kansas Supreme Court ruled lawmakers are not living up to their constitutional requirement to adequately fund schools. To address the issue, Gov. Brownback opened the 2018 legislative session with a budget proposal to boost state spending on public schools by $600 million over the next 5 years. Had the proposal come from a governor with a different name, it might have seemed a reasonable start. From Sam Brownback, however, it struck a note of great dissonance. After all, just a few months ago he blasted legislators for overturning his income tax cuts, and sharply criticized them for overspending. Now he was recommending a budget that used every penny of the new tax revenue, contained virtually no spending cuts, and added $600 million of expenses on top. 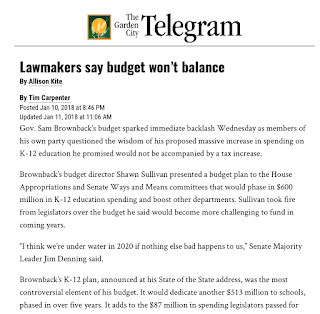 Legislators from his own party immediately cried foul, arguing that Brownback's proposed $600 million takes the budget way out of balance. Last session's reversal of the Brownback tax plan-step one in fixing Kansas finances-brought Kansas out of crisis mode, but did not fully close a huge gap between revenue and expenses. Adding $600 million of additional spending into the equation widens the gap further. But therein lies the challenge of step two. Legislators must both add money and balance the budget. Brownback is correct in part. New school money has to be budgeted. But to do that realistically and responsibly requires more revenue, if not during this session, then definitely in the next. Brownback skipped over the hard part, and kept mum about his own culpability in creating revenue problems for the state in the first place. So, just as in the last legislative session when they overrode Brownback's tax veto, it appears a bipartisan coalition of legislators will have to again go it alone without leadership from the governor. That makes the task much harder, but that's the next step. The success of the 2018 legislative session will be measured by how well lawmakers achieve step two.